NEASPEC Secretariat in partnership with the Innovative Green and Development Programme (iGDP) organized the Green Transformation in Wuhan: International Consultation Workshop for Low-carbon City Roadmap on 11 June 2018 in Wuhan China as the first peer review workshop under the NEASPEC North-East Asia Low Carbon City Platform (NEA LCCP). This workshop brought together more than 100 participants with expertise in the field of low carbon city planning and policy, specifically from 14 district-level governments and Wuhan local institutions, city representatives from peer Chinese cities and Northeast Asian cities including representatives of Changsha, Guiyang, Shenzhen, Guangzhou, Qingdao and Shanghai, Jiangxi Province, Shanxi Province, Kitakyushu, Seoul and Incheon, and experts from both international and domestic research institutions. The workshop built on previous research on Wuhan’s carbon peaking and policy efforts by members of international and domestic research agencies, such as Energy Foundation, Rocky Mountain Institute, World Resources Institute, Natural Resources Defense Council, C40, and innovative Green Development Program, China Sustainable Transportation Center, and CITIC General Institute of Architectural Design and Research. It contained four sessions: the first session introduced the planning and implementation of Wuhan’s carbon peaking policy plan and included an in-depth discussion on Wuhan’s experiences, key lessons and next steps. The second session featured reviews of the low carbon policy experiences of other cities in China, Japan and Korea. 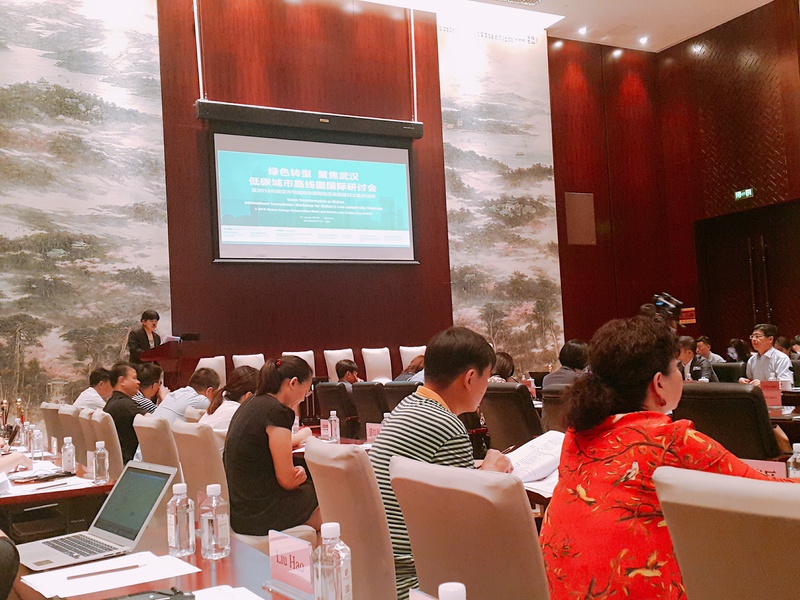 The third session featured discussions about the sectors that will be important in achieving Wuhan’s carbon peak, principally industry, transportation and buildings. The fourth session was dedicated to key topical areas in carbon reduction efforts - green finance and carbon trading, air pollution prevention and carbon mitigation co-benefits, near-zero carbon emissions zones, and high-efficiency cooling and HFC reduction. The workshop was successful in exposing workshop participants to valuable new knowledge about low carbon city policy in China and Northeast Asia broadly. Participants expressed enthusiasm for learning from and sharing Wuhan’s experience as model for other peaking efforts at the city level. For more information, please click the programme.